Fills full the wanton eye with May's delight. Hawthorn (Crataegus monogyna) is the most well-known herb for the heart. This member of the rose family has white to brownish flowers, deeply lobed and rose-like leaves, brown woody stems, and yellowish-brown to wine-red fruit which is oval, wrinkled, and berry-like (actually a pome). 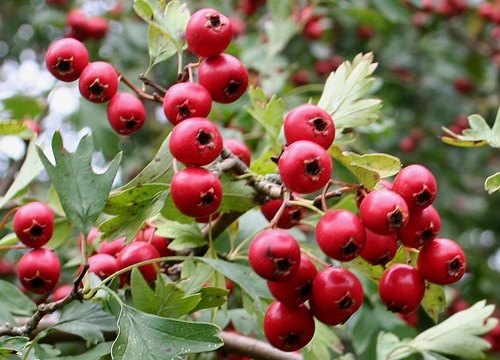 Commonly used in teas, tinctures, and capsules to treat the heart, the legends surrounding Hawthorn trees go back centuries, especially in Europe and the British Isles. The most famous Hawthorn in Britain is the Holy Thorn of Glastonbury, which grows at Glastonbury Tor, the supposed resting place of King Arthur. According to legend, the tree was grown after Joseph of Arimathea, upon arriving at Glastonbury Tor, thrust his staff into the ground, and from this the tree grew. Although the original is no longer there, several of its supposed descendants still grow there. When it blooms during the winter, a sprig is traditionally sent to the Queen, who is said to decorate her breakfast table on Christmas morning. Thomas the Rhymer, a 13th century mystic and poet, was said to have met the Fairy Queen underneath a Hawthorn tree. Particularly sacred is any grove with oak, ash, and Hawthorn, as it is said this is where the fairy folk reside. The Hawthorn tree is a symbol of love and the union of couples in marriage, and is one of the sacred trees of the Wiccan religion. And if on May Day one was to bathe in the dew of Hawthorn leaves and blossoms, ones luck, heath, and beauty was said to increase exponentially for the following year. Berries: Flavonoids and oligomeric procyanidins. The berries have more hyperoside than the leaves and flowers, and the leaves and flowers contain more vitexin rhamnoside than the berries. Leaf and Flower: Flavonoids and oligomeric procyanidins, rutin, catechols, pheno-carboxylic acids (especially chlorogenic acid), sterols, amines, coumadins, and purines. The leaves contain the highest concentrations of flavonoids if they are harvested just before the plant blooms. Plants that grow during drought and after late frosts have the most antioxidants. 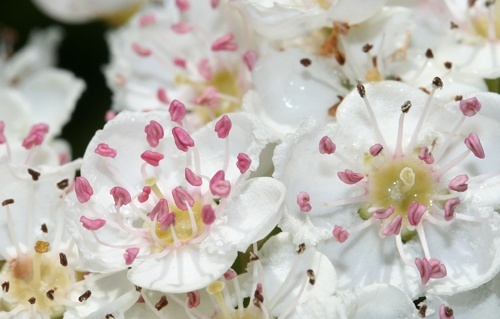 Hawthorn is a very useful botanical; the berry, leaf, flower, and stem are all used! All of these can be transformed into elixirs, tinctures, teas, or capsules. Fresh berries can also be used in pies, jams and jellies and dried berries in sauces, wines, syrups, and infused vinegars. 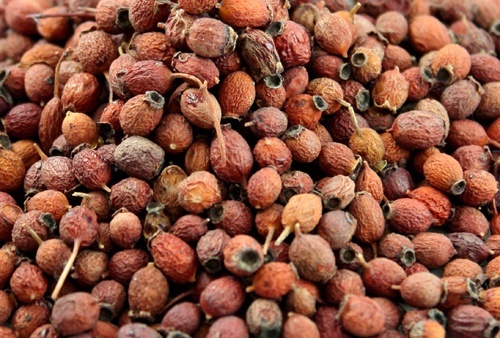 Hawthorn Berries: Taken in excess, Hawthorn berry teas can cause mild diarrhea. This does not occur when the berries are used to make tinctures or are encapsulated. Diarrhea is not a side effect of the leaf and flowers. Taken in excess, Hawthorn berry soft drinks, especially if they are made with the powder, can cause mild diarrhea. (Rice is added to the blend to prevent stomach upset.) Diarrhea does not occur as a result of using the herb when the berry powder is used to make tinctures or are encapsulated. Diarrhea is not a side effect of the leaf and flowers. Hawthorn Leaf and Flower: None. Ready to Enjoy the Benefits of Hawthorn? Make Your Own Hawthorn Berry Elixir for Heart Health!